Okay, okay, a 3 drop with no ETB effect in a format with a 4 mana wrath in one of the best decks is probably just bad. The text on this card has me drooling: a card advantage engine on an above rate flyer. So I guess that I am talking about fun FNM decks. I like fun FNM decks! Please help with ideas and decklists. Abraham Stein has an article on Star City Games here. Sheltering Light - Doesn't help against Vraska's Contempt or Hostage Taker, but a good rate and scry. Defiant Strike - Hey, cantrips. Reckless Rage - prone to blowouts, but when it works, one mana 4 damage at instant speed is a good rate. Unbreakable Formation - Feather doesn't recur, but probably needed at least in the board for sweeper protection. Ancient Animus - Obvious combo with Feather, but not good against noncreature decks and how many other legendaries are we running? Band Together - expensive, but can target two of our creatures! Does she work with Judith? Mardu anyone? I believe Jeskai is the best shell. It offers Beamsplitter Mage and some good counters like Essence Capture and Dovin's Veto. Another card I think belongs to this deck is Dreadhorde Arcanist. Beamsplitter Mage, Tenth District Legionnaire, Dreadhorde Arcanist and Feather, the Redeemed. And I'm not even sure the deck should include all of these. Weirdly I'd drop Tenth District Legionnaire first in favor of Tajic, Legion's Edge or Aurelia, Exemplar of Justice to help the Arcanist a little. Jeskai is an option but maybe to ambitious. I really think that an Aggro Boros can be the most reasonable/safe shelter for her. She is already good by herself and synergizes with the great adition of Tenth District Legionnaire, the best heroic card after Favored Hoplite. 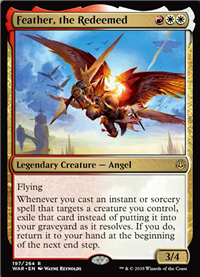 The new Gideon is also a reason to play an Boros Aggro. He and Tenth can be targeted by Reckless Rage all day, killing all the enemies creatures. He can also after 2 turns, exile any nonland permanent. It´s weird because is a deck that can be really fast, but can adapt itself to play safely with the help of Gideon and Sheltering Light. The pump spells can also be played defensively agaisnt red decks, where integrity/intervation can play a big role. Nice work Ryder052! Lots of good finds. Gird for Battle and Wee Dragonauts stand out to me. Since I change decks so often, I want to ask you to make/lead the thread in Deck Creation when the spoiler is complete (but "no" is always a fine answer). There are so many ways to do this. If we could reliably get Arcanist to 3 power, imagine a turn of Heroic Reinforcements then recast Heroic Reinforcements with Arcanist. Edited to fill in sideboard. Guys, I think you're sleeping on Samut's Sprint if you're building around Feather and Dreadhorde Arcanist, it has amazing synergy with both of those cards, I think it deserves to be tested, getting +4/+2 and Scry 2 for R using the Arcanist sounds better than Run Amok, since the Arcanist has built-in Trample, and Feather already flies, so having even more card filtering should improve the consistency of the deck, Run Amok may help you go all-in faster, but card filtering is nothing to scoff at, and I may even try it over Defiant Strike, +1/+0 sounds too weak even with the cantrip effect. Excellent work guys! I am particularly impressed with Ryder's testing. The builds I had best results with were aggressive. One of my best creatures was Lagonna Band Trailblazer, an 0/4 for 1. The effects we were trying to exploit were not huge, a few counters. So I found that I needed to nearly win before the midrange and controlling decks got rolling. But this is a different deck and a different meta, so that may all be incorrect. There are also a lot of ways to take this, and the different builds may perform differently against different other decks. But I get defensive when I am told that budget is the only reason to run pure Boros. I did it because I envisioned an aggro build and game plan. Aggro is not the only game plan, and I can't really argue that it's the best without a lot of testing, but it seems like a possible game plan that may excel in some meta. I love the idea of Essence Capture, but UU seems hard. I am thinking that we will need all the random scry effects like those on the Tenth District Legionnaire that I have been ignoring. All our versions will be somewhat combo-ish, needing a good distribution of lands, creatures and spells to be powerful. Nice! TBH, I don't even want to think about a deck that can cast Feather and Llanowar Elves on T1.